WCHS has adopted the panel seen on the right — Globe, Lamp, Bible and Carpenter’s Square, symbolizing the Word of God building souls and enlightening the world. St. Paul AME Church was founded in 1848 by the African-American membership of Edenton Street United Methodist Church. The cornerstone of the present church was laid in 1884 and work was completed in 1909; however, that same year the building was gutted by fire, and subsequently rebuilt and rededicated in 1910. 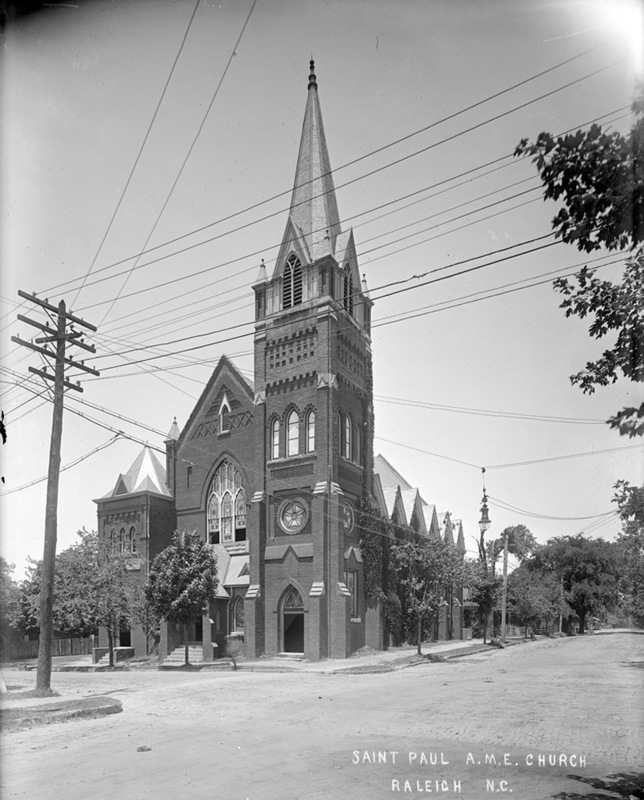 It is one of only three Raleigh churches on the National Register of Historic Places, and is a Raleigh Historic Landmark. St. Paul is the oldest independent African-American church in Wake County. 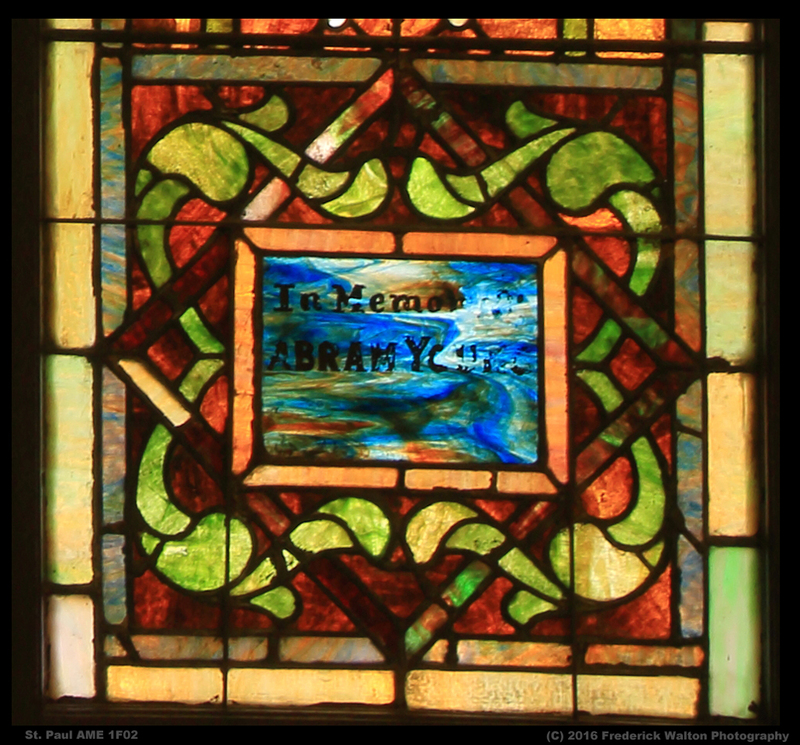 St. Paul AME is looking for support to repair and conserve the beautiful and historic art glass windows. They are more than 100 years old, and were originally imported from Europe. Time and weather have taken their toll and threaten these windows if action is not taken. The estimated cost to repair the windows and protect them from future damage is about $145,000. 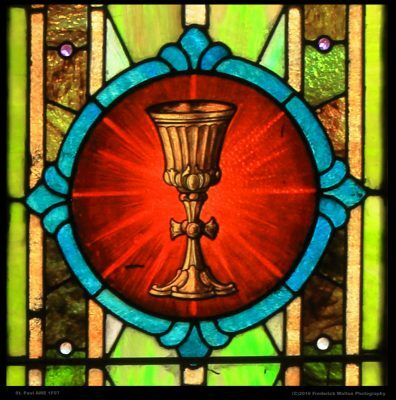 The church is praying for your help in this project. 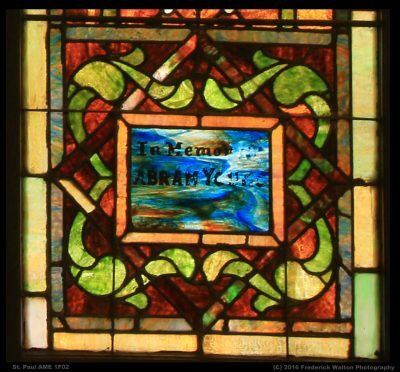 A damaged dedication panel to Abram Young in one of the windows. 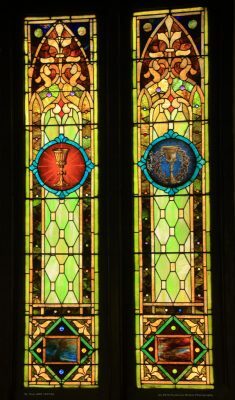 Church leaders including the Reverend Gregory L. Edmond, Pastor, and members of the Wake County Historical Society Board will lead a discussion of this important program to restore the historic windows of St. Paul AME Church. 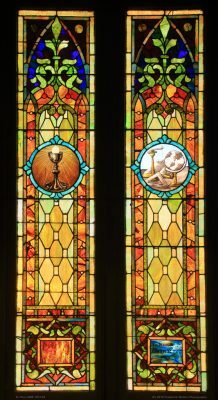 Tours of the windows will be led by members of the Wake County Historical Society. The church’s beautiful sanctuary and it’s stained glass windows are not to be missed! 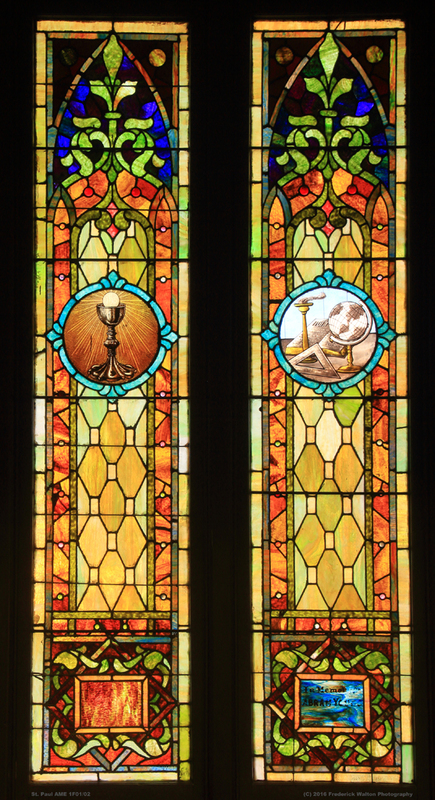 The stained glass windows of St. Paul AME Church are resplendent with Christian symbology. WCHS will announce that it is adopting a window and encourages you to be generous, too. St. Paul AME Church is located at 402 W. Edenton Street, between Harrington and West Streets, with plenty of on-street parking and parking spaces behind the church available. Please enter through the main entrance on Edenton Street. All donations, large or small, are tax-deductible, and will be graciously accepted, with checks made out to St. Paul AME Church. 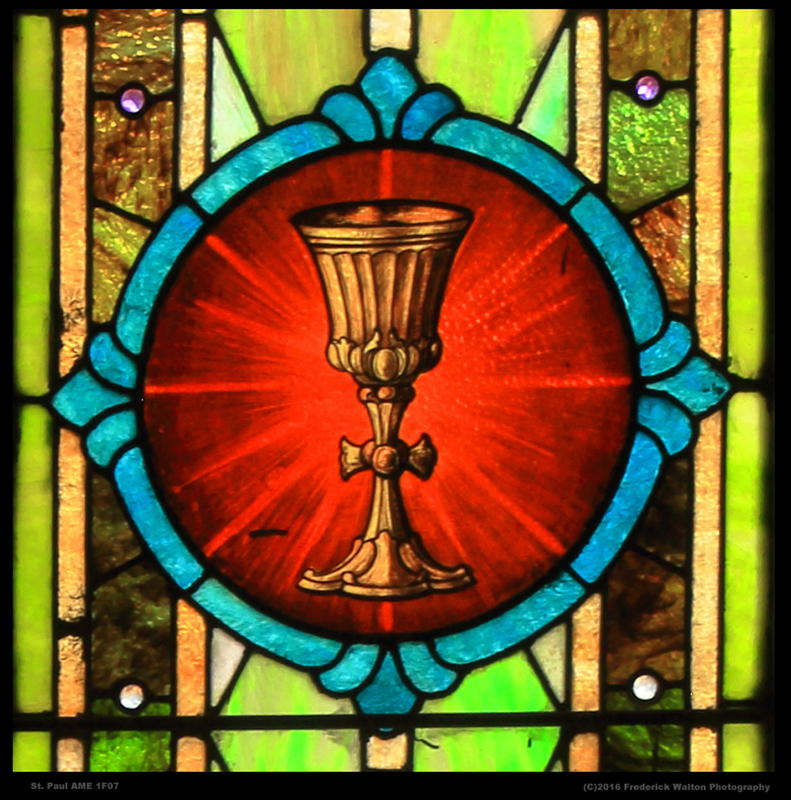 The radiant chalice reminds us of the significance of Holy Communion in Christian worship. 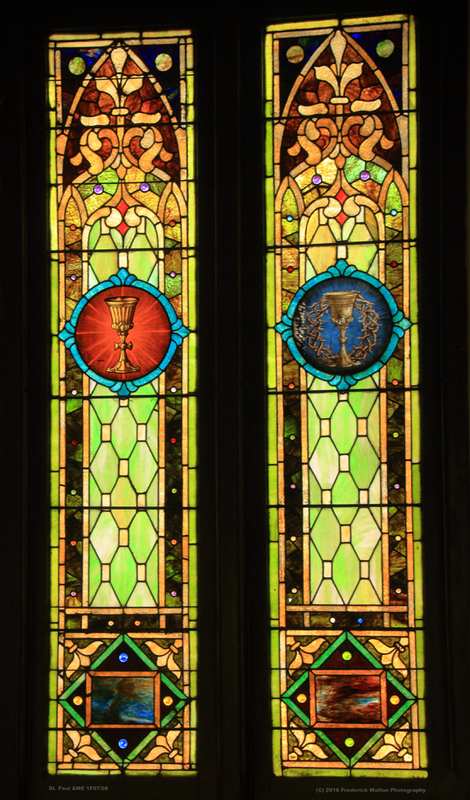 You can read more about the St. Paul AME window restoration project in the News and Observer. Window photographs by Frederick Walton Photography.